Last weekend I was in London for the London street symposium. It was a great time and one of my personal highlights was a trilogy of events. Matt Stuart is a British, London (not for much longer) based street photographer. He was one of the founders of In-Public (along with Nick Turpin) and he has just joined Magnum as a photographer. He got into photography after being a touring skateboarder, working in a telephone call centre and his father introducing him to the works of Bresson and Frank while he was working in customer services. He quickly started taking photos of the quirks of life as well as working as an assistant for a photographer. Soon he set out on his own as a commercial photographer but he is known to many thanks to his street photography style. During Matt’s talk I really appreciated how his photos reflect his personality. He was full of jokes and enthusiasm. He clearly enjoyed being with people and punchlines. Some other elements that really struck me about Matt’s approach included how he knew the settings for shooting inside a tube train (f2.8 1/60 ISO..200 I think?) also in his stories, it became clear that he had become familiar with the adverts around the city and was always looking to find interesting subjects to go with them. That’s the sort of thing which you get from shooting the same route (he walks the exact same route everyday past the same places) and really knowing your place. You can’t do that if you visit different places or travel round the world. I choose this picture because I feel it has three or so elements which I think reflect Matt’s style a lot. First there is the obvious humour of the devil figure with the locked tire wheel. The implication of mischief or having done something bad is great. 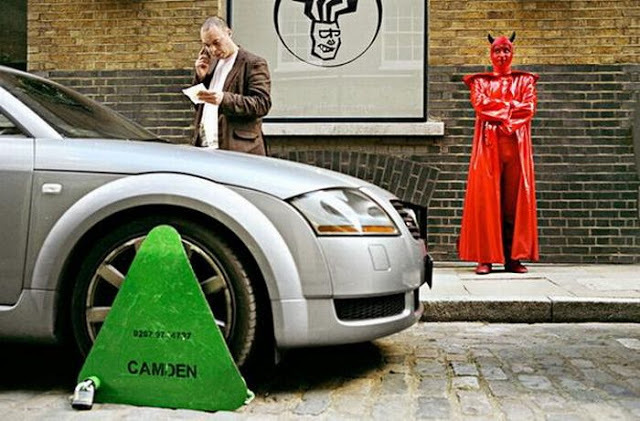 Then there is the colour contrast between the green and red (Matt is a pro of colour), finally there are the layers of the image with the foreground tire, midground man on the phone and the background devil with the face in the post looking towards him. All in all it’s a great image which shows off Matt’s awareness of the world around him and how he combines different elements. To join in with #MondayMasters all you need to do is share something of Matt’s which inspires you as a photographer and use the hashtag.